Nick Bilton reports for The New York Times that Apple is "experimenting" with smart watches made of curved glass, "according to people familiar with the company's explorations". The article notes that Corning -- the company behind the iPhone's Gorilla Glass -- has developed a bendable glass called Willow Glass that could potentially be used in a wristwatch type device that curves with the wearer's wrist. Smart watches have been a topic of conversation in recent weeks, with the Pebble watch shipping last month, and a number of rumors regarding Apple working on a smart watch for possible launch later in 2013. In court filings between Apple and Samsung, we learned that Apple wanted to use curved glass designs in the original iPhone but the technology available at the time wasn't sufficiently advanced. With the recent advances at Corning however, it appears that Apple's curved glass ambitions could soon be coming to fruition. Wearable fitness-focused devices were popular at CES this year, with devices like the Jawbone UP and Nike FuelBand leading the way. Apple CEO Tim Cook is a Nike board member and spoke about his Nike FuelBand at the D10 Conference last year, but demurred about Apple's plans. He did say that wearable devices were "an interesting area", though "the book hasn't been written on that yet." Am I the only one who thinks the whole smart-watch thing is a gimmick? I'm sure there are lots of experiments happening in Ive's über-secret design lab. Doesn't mean they'll ever become products available for sale. I'd love to see what Apple could do in this space though. It seems now Apple is trying to follow the market instead of the market following them. I mean, look at iPhone +, which will have 5" screen to imitate the S3. 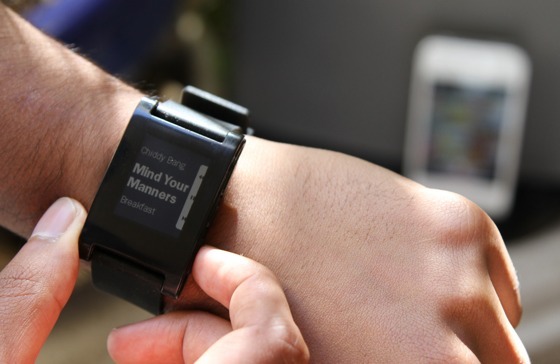 And the iWatch will be an imitation of the Pebble watch. Is Apple just surviving? Silly, uninformed post. There were MP3 players before the iPod, smartphones, before the iPhone, and tablets before the iPad. Apple defines the market by reimagining how people will use and interact with these products - and making products that people actually want to use - not by making up whole new product categories. I thought so too, until I read this article (http://asktog.com/atc/apple-iwatch/) by Bruce Tognazzini, a former Apple human interface designer. The possibilities with an iWatch are absolutely fantastic. I recommend checking out that article. It will completely change your mind. I have seen this topic on other sites and people obsess about the watch part - STOP thinking about it as a watch and START thinking about it as a bluetooth remote display for your iPhone in your pocket, purse, or briefcase. Notifications, caller ID, Map apps, emails or whatever on your phone all get mirrored from your phone to your wrist if you want it. If it is just a watch with a few tricks added it will fail.